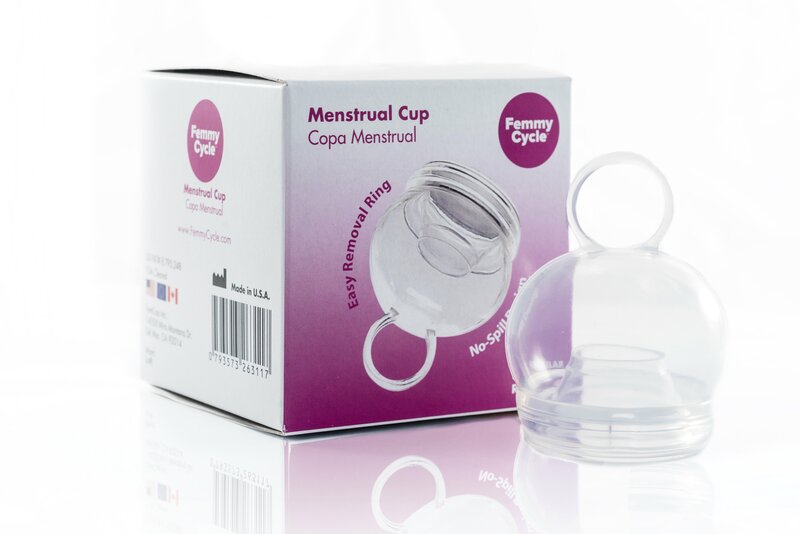 Say goodbye to pads, tampons and leaky irritating menstrual cups! Please note that the Femmy Cycle prices quoted in the video are in US Dollars. The prices quoted on this website are in Canadian Dollars. The prices are the same cost to you. * Spill-proof: minimizes the mess and leakage associated with almost all other feminine sanitary products. The FemmyCycle ® is ideal for active, athletic and working women. Stem: It’s a loop, like a handle! Guarantee: The FemmyCycle is easy to use. If you can use a tampon you should be able to use the FemmyCycle. This is a device inserted into the body and so we cannot accept returns. Other: Received the Why Didn’t I Think of That? Award, in 2012, at the Medical Device and Diagnostics Expo. Collecting menstrual flow rather than absorbing it eliminates the risk of toxic shock syndrome associated with tampons. 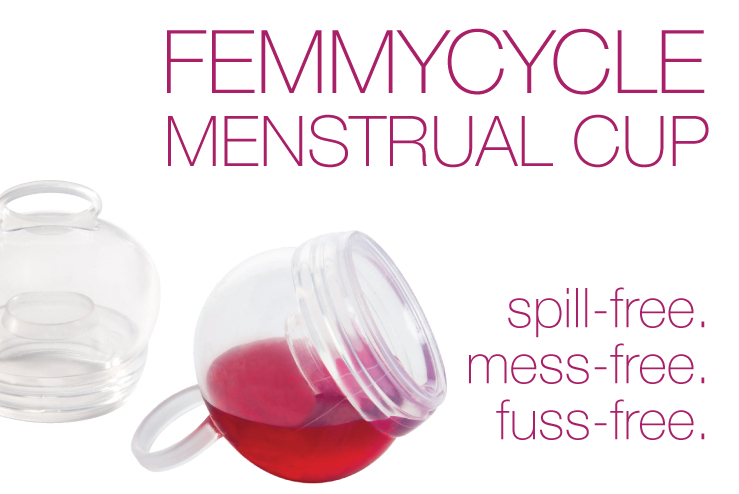 The FemmyCycle’s® unique, non-spill-design collects and holds menstrual flow for up to 12 hours. The FemmyCycle® can be worn during, sleep, exercise and other daily activities, so it is ideal for athletes and working women. 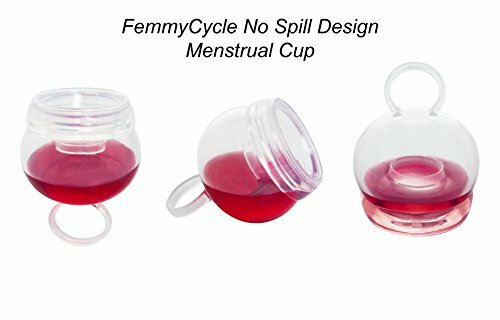 like all other menstrual cups are designed to do. ~ It has a ring instead of a stem, which makes it very easy to remove. 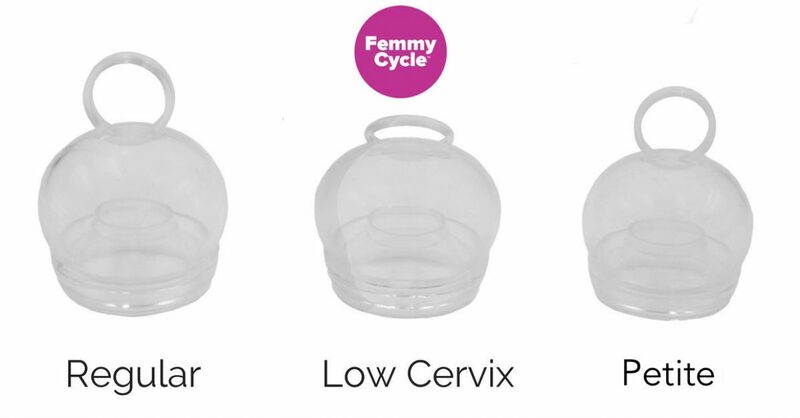 ~ Femmy Cycle is North American, made of hypoallergenic medical grade silicone, not latex. * One pouch that snaps closed, large enough to hold two cups. * A full page of colour instructions in English on hard card stock paper. * Please request Spanish or French language instructions in the Comments with your order. Veuillez en faire la demande Espagnol ou français langue instructions dans les commentaires de votre commande. Por favor, solicitar Español o Francés las instrucciones en lenguaje en los comentarios de su pedido. Feel fresh, clean and confident during your menstrual cycle. One Cup to Rule Them All! 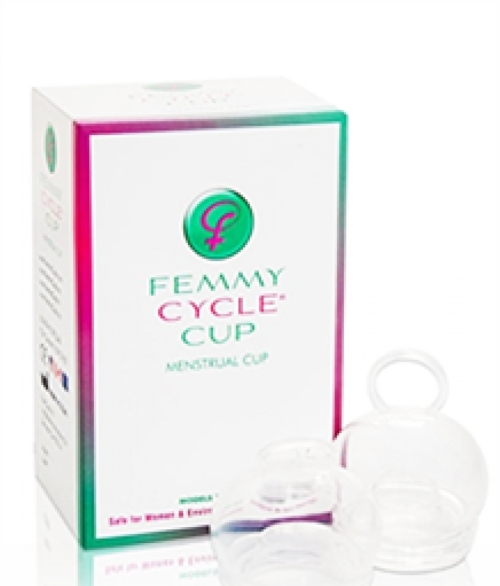 Blogger call Femmy Cycle "The Magical Cup"! For young women who are not fully grown and have not been sexually active and/or women who have small vaginas. For women whose cervix is less than a finger's length from the opening of the body. How can you tell if you have a low cervix? Just measure the distance between your vaginal opening and your cervix. If it is less than 2 inches then you have a low cervix. Femmy Cycles cannot be returned or refunded once the tamper-proof sticker has been removed.